Cappy had his vision restored in one eye after groundbreaking cataract surgery. Like many northern elephant seal pups rescued by The Marine Mammal Center each spring, Cappy was found alone on a beach, looking malnourished and lethargic. The beach was Fisherman’s Beach in San Luis Obispo County, a bad place for an elephant seal to be because it is often crowded with people and dogs. Luckily for Cappy, people on the beach called the Center and a team of rescuers was on the way. Cappy was brought to our hospital in Sausalito and examined, and it was found that he had cataracts in both eyes. The resulting blindness inhibited his ability to hunt for food, leaving him weak and hungry. It is likely that because of Cappy's young age, the cause of the cataracts was congenital, meaning that it started before he was born. The Center worked with veterinary ophthalmologist Dr. Kate Freeman to carry out two operations to remove the cataracts from Cappy’s eyes. The process involved a highly advanced process known as phacoemulsification, which uses sound waves to break down the lens of the eyes and "emulsify" it. Once broken down, the emulsified lens is extracted from the lens capsule. The surgery was successful in restoring vision to Cappy's left eye, although it was suspected that he would never regain full vision in his right eye. 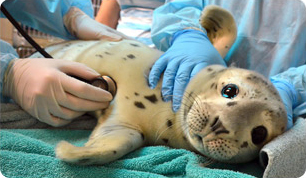 After the surgery, Cappy was eating well and getting regular eyedrop treatments from the volunteer animal care crews. Four months after he was brought into the Center for treatment, Cappy was released back to the ocean, at Año Nuevo State Reserve. After his carrier was opened at Bight Beach, he heard the large number of elephant seals at nearby North Point and quickly made his way off in their direction. Cappy was seen again several times after his release, and had been making his way back and forth between Año Nuevo Island and the mainland. This is a good sign that he is hunting on his own and doing well in the wild.